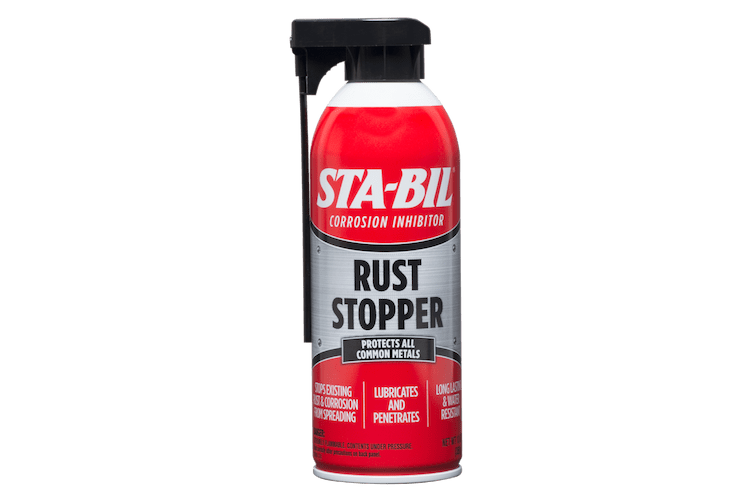 STA-BIL® Rust Stopper is an aerosol spray that delivers a protective coating for exposed metals, preventing rust and corrosion. Untreated and treated metals can rust within weeks of exposure. STA-BIL® Rust Stopper prevents rust and corrosion by protecting metal surfaces with a long-lasting barrier while maintaining joint and pivot points to move freely. Use anywhere metal needs to be protected from rust and corrosion. Water Resistant – Specialized formula prevents normal water erosion and keeps the protected surface from developing water stream markings resulting in uneven corrosion. Stops Existing Rust – Once rust is present, our innovative formulation stops rust in its tracks while offering a protective coating in its place. Shake Well before using. Apply two to three inches away from the surface (if possible) and swipe back and forth to apply an even coat on the surface of the metal. Removal: High pressure, cold water pressure wash (1,000-3,000 psi) is recommended. A standard, industrial strength pressure washer will suffice. Can also be removed by warm water detergent wash or with a commercial-grade biodegradable cleaner. Does this product creep into seams? Yes, it will penetrate wherever it is sprayed. What color does it leave behind? STA-BIL Rust Stopper leaves a caramel-colored coating. If the metal is dark, it may not be as visible. However, if the metal is shiny or reflective, such as chrome, it will more than likely be visible. 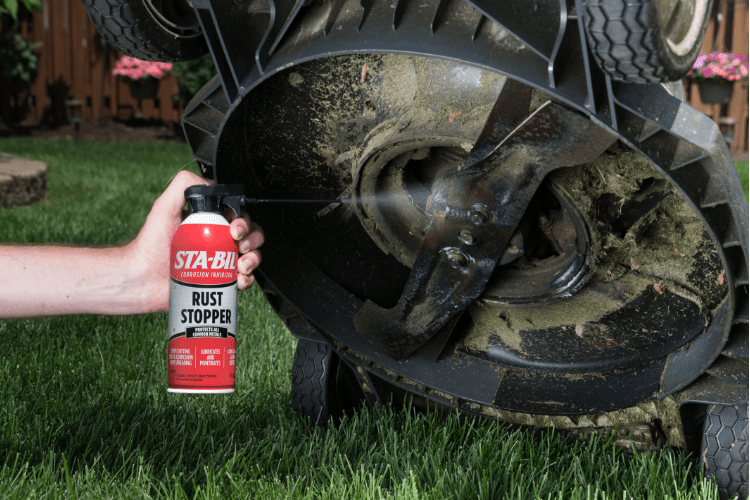 How often should you apply STA-BIL Rust Stopper? 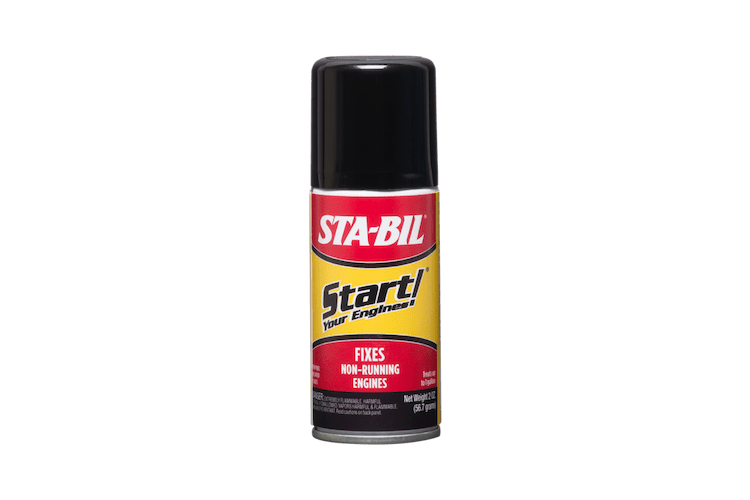 In rainy winter conditions we recommend applying STA-BIL Rust Stopper ever 2 months. 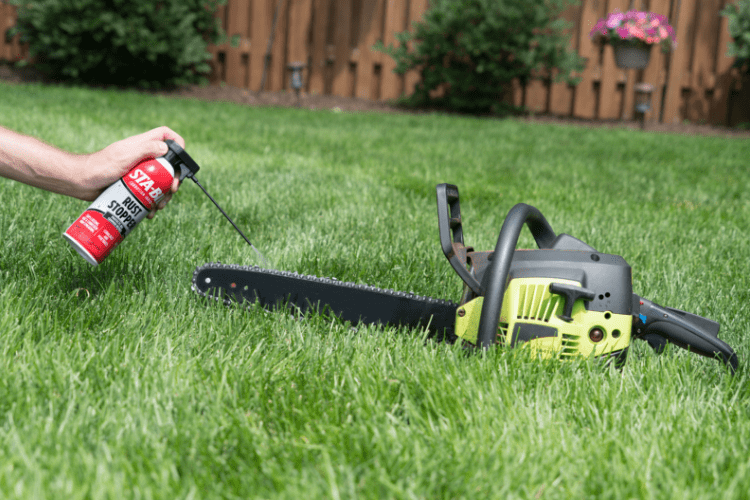 In dry, less wet climates, apply every 6 months. 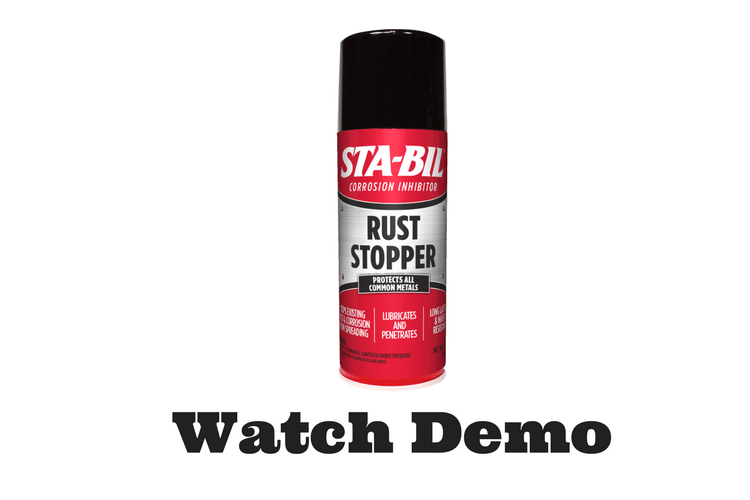 Does STA-BIL Rust Stopper contain acid and will it remove the finish or coatings? 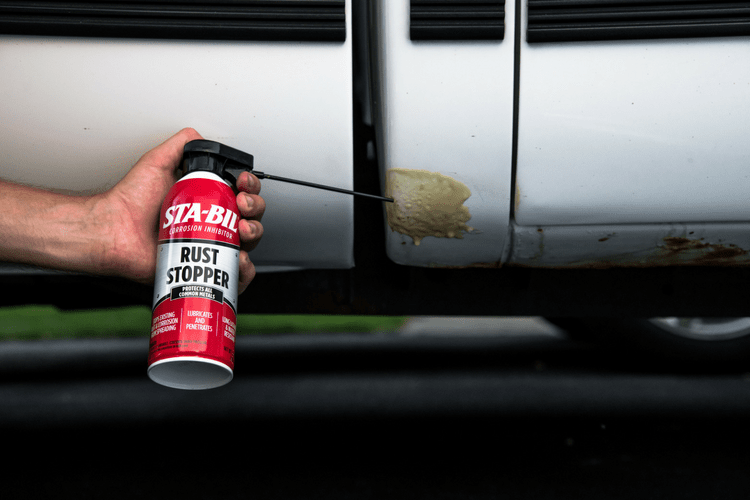 STA-BIL Rust Stopper is safe to use on painted surfaces or finishes. However, please keep in mind that this product will leave an oily coating (which is what protects the surface) that can be difficult to remove. 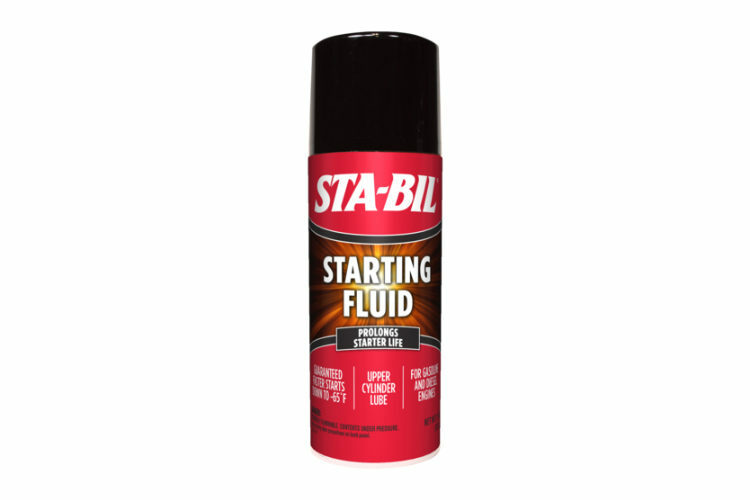 Can I use grease on areas treated with STA-BIL Rust Stopper? If applied first, Rust Stopper may impede proper greasing on components. However, it will not negatively affect already-greased or lubricated components if applied over the greased or lubricated area. 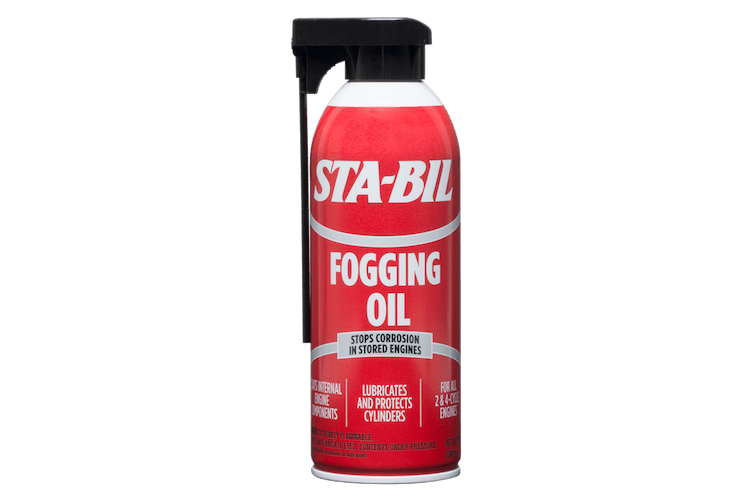 STA-BIL® Rust Stopper is rated 4.8 out of 5 by 17. Rated 5 out of 5 by Shocker from Works! I used this product on Hi-Lift jacks that I left outside over the winter. They have two pins that toggle when raising or lowering, they rusted and wouldn't toggle without help of screw driver. I soaked with oil which helped but not completely so sprayed with Rust Stopper a couple times and pins now function normally. Rated 5 out of 5 by racerrandy from Stops Rust And More I used to live in the Midwest, where rust was always an issue. 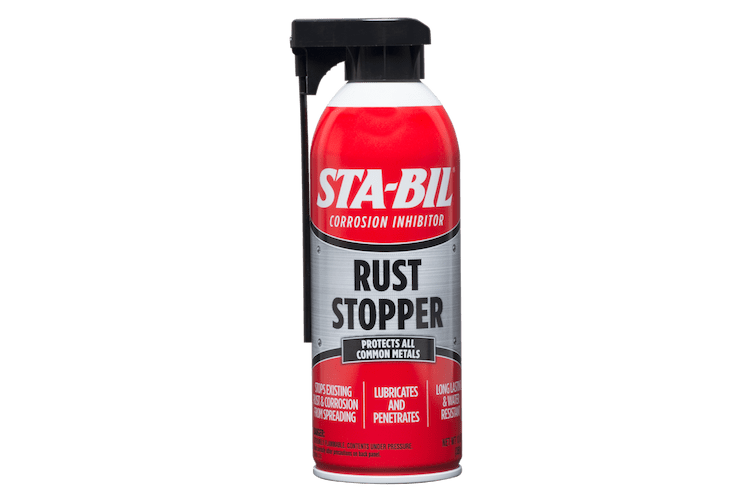 A product like Sta-Bil Rust Stopper was necessary to stop corrosion on components on cars, trucks, and snowblowers. Now I live in a much warmer and drier climate. That said, I still use Sta-Bil Rust Stopper on several pieces of equipment. Rust Stopper lubricates and penetrates joints and pivot points, allowing them to move freely and quietly. 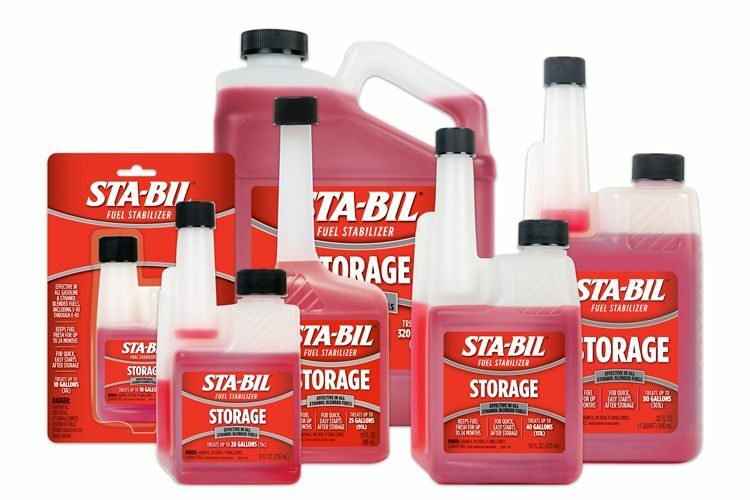 Try Sta-Bil Rust Stopper on your equipment....it works regardless of where you live. Rated 5 out of 5 by Barnmb from Rust Stopper I received this sample and decided to use it in my woodworking shop on all of my cast iron power tool tables. My shop is pretty damp I this should help prevent the tables from rusting. Rated 5 out of 5 by vette84 from Saved My Grandfathers old iron patio set I sprayed STA-BI rust stopper on my iron/steel patio table and 2 iron/steel chairs that I had stripped off all the paint to the bare metal . This patio was my grandfathers and is probably 75 years old. The patio set has been outside uncovered for several weeks in the rain and snow . To my surprise there is absolutely no rust on the bare metal any where. This product is amazing. I plan on using it on my outside BBQ grill next. Rated 5 out of 5 by mikec from This product really works! I used this product on my 25 year old lawn tractor that has a few rusty areas on it. I followed the directions and could see this product working on the rusty areas. I sure hope that that this product will stop the rust from spreading...time will tell. I also used this product on some rusty garden tools with the same result. I like this product!! Rated 5 out of 5 by PRM1 from I received this product and decided to use this on my trailer bumper which is constantly rusting. After prepping the surface and removing the existing rust, The Rust Stopper was easy to apply. I applied this a month ago and nothing has shown up in all that time which shows it does what it says it is supposed to. Great product. Rated 5 out of 5 by JeepsterXX from Used this in some the "crevice" areas of my Jeep that typically rust. Sure seems like it will help but time will tell. I'll update with future evaluation. Sta-Bil is one of my very trusted brands!